Complete the Medical Provider Volunteer Form Online Here. Nearly 100 dentists currently volunteer at our Downtown Greenville location on a quarterly rotation. Volunteer dentists perform extractions for our patients every Tuesday and Thursday evening. The GFMC dental clinic also utilizes the services of fourth-year MUSC dental students for 12 weeks each fall and spring semester. These students spend their clinical experience performing restorative care for our patients. Interested dental professionals should contact the Dental Assistant at (864) 232-1470 ext. 26 or by email. Our front office volunteers perform daily patient screening interviews, a core function of theGFMC patient experience. Patients must be qualified for services before every visit with the physician or dentist. We require at least three and as many as ten front office volunteers each day we see patients. Front office volunteers do not need any experience in a medical environment. The only requirements are a detail-oriented approach and a compassionate attitude. Other duties include helping front office staff prepare for upcoming clinics, filing and pulling patient charts, answering phones, reminding patients of upcoming appointments and/or covering the front desk in the absence of a staff member. We request that all screeners give a minimum of 24 hours notice if they are unable to work their scheduled shift. Prospective non-medical volunteers should contact the Volunteer Coordinator by email, by phone (864) 232-1470, ext. 34 or simply fill out the Volunteer application below. Complete the Non-Medical Volunteer Form Online Here. Many of GFMC’s volunteer dentists bring assistants with them, but when they don’t, it’s helpful to have a few of our own to help. Dental assistants are needed during the extraction clinic every Tuesday and Thursday after 5 pm and during the day on Mondays, Tuesdays and Thursdays when MUSC dental students are present for clinicals during the fall and spring semesters. 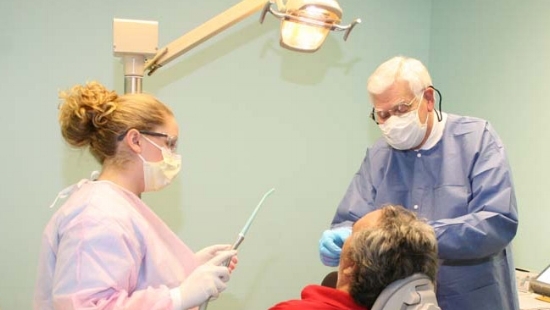 Many of our patients receive dental hygiene treatment from the Greenville Tech students. The need for additional help is great, especially in the summer. We can usually schedule patients around your availability. Contact us for additional details. Interested dental assistants and hygienists should contact the Dental Director at (864) 232-1470 ext. 26 or by email. Para informacion en español, por favor haga clic aqui.